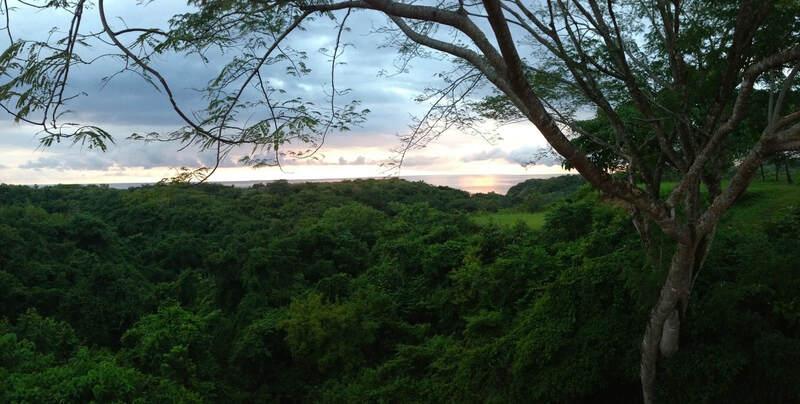 Encompassing more than 25 acres, Rayos Del Sol's grounds are a mix of wild jungle and manicured tropical getaway. Situated on top of a hill, there are panoramic ocean views and cool breezes. The grand layout creates opportunities to explore unknown territory, discover new activities, and create unique experiences. The grounds include an outdoor gym, yoga deck, obstacle course, fire pit, trails through the jungle and to the beach, pool, restaurant, and a lush event space overlooking it all. Playa Ostional's beautiful black sand beach is a 10 minute walk down the hill, and is an amazing place to watch the sunset while playing in the waves. This beach is also a major nesting ground for the Olive Ridley sea turtle. ​I am a yoga and fitness instructor living in Washington DC. I believe in the power of yoga to change lives for the better and am excited to share that with others. I believe that gaining strength and stamina on the outside can help lead to strength and stamina on the inside. I believe that being grateful for our strong and capable bodies in every activity, no matter what that body might look like, makes a difference in how we live our lives. I have a passion for teaching both yoga and fitness and I simply love what I do! This 7 day, 6 night retreat will help you relax, feel restored, and reconnect with yourself and others. Tell me about the price and accommodations! Do you have questions or comments? Do you need a payment plan? Contact me, we'll work things out! Sign up for free monthly online yoga classes!